Does our honorable assembly man realize that the RIGHTS and control over Sabah and Sarawak Territorial Waters was taken from Sabah and Sarawak in 1969? Then in 24th November 2011 these RIGHTS and control was accidentally given back to Sabah and Sarawak? For every day that we delay in making any decision on this issue, we are wasting millions of ringgit which can be used productively in the state development efforts especially in combating poverty in Sabah. If you are NOT aware and have not realize these by now that Sabah lost its RIGHTs and Control over its own Territorial Waters then read on. Otherwise thank you for taking time to look at this pamphlets and talking to us. Six months after the Prime Minister’s announcement the lifting of the proclamation of Emergency on the 24 November 2011 under Article 150 (7) of the Malaysia Constitution, it took effect. Therefore, on the 24 May 2012, the RIGHTS and Control of Sabah and Sarawak over our Territorial Waters go back to Sabah and Sarawak Government, the Federal Government does not own these Territorial Waters anymore. How did we lost it? Ordinance No.7 1969 limits the State’s territorial waters to 3 nautical miles including Sabah and Sarawak. When it was passed in 1966 cannot be applied in Sabah and Sarawak without the consent of the respective State Government. But The 2 Acts only came into force for Sabah and Sarawak after gazette P.U. (A)467/1969 Emergency (Essential Powers) Ordinance No.10 of 1969 dated 8th November 1969 was issued. The Emergency Proclaimed using Article 150 gives absolute power to the Federal Cabinet. The laws that were created when the country was in the State of the Emergency cannot be invalidated or it is unconstitutional. These laws circumvent the safeguards and caveats that were emplaced by the Malaysia Agreement 1963 and the Inter-Governmental Committee (IGC) Reports. How did we got it back? It was only after the emergency proclamation was lifted under Article 150 (7) and after six months have lapse that these Ordinance, gezettes and laws are annulled. Therefore, everything goes back to normal, Sabah and Sarawak continues to enjoy the protection of the Malaysia Constitution, the Safeguards and Caveats emplaced by the Malaysia Agreement and the Inter-Governmental Committee (IGC) Reports. This means that Sabah and Sarawak Territorial Waters is once again in the hands of the respective State Governments. Once again these Territorial Waters is administered and managed by the respective State government based on their respective Land Ordinance and the North Borneo (Alteration of Boundaries) Order in Council 1954. The Territorial Waters of Sabah and Sarawak covers the whole Continental Shelf. After knowing these facts, it is your duties and responsibilities NOT just as the Ahli Dewan Undangan Negeri Sabah but most importantly as Malaysians in Sabah to raise these issues of Sabah RIGHTs and Sabah Territorial Waters in this august house. Realizing their mistake the Federal Government wants the Sabah and Sarawak Territorial Waters back. On 18th April 2012 before the six months lapse, the Federal Government tabled a Malaysia Territorial Sea Bill 2012. The main purpose of the Bill was to comply with UNCLOS however the main purpose of the Bill was to take back the Ownership of the Territorial Waters inclusive of Sabah and Sarawak. The Bill was passed without any of Sabah and Sarawak MPs debating it. Since Malaysia is no more in Emergency, the new Act 750 cannot be simply enforced in Sabah and Sarawak. It concern Land and Land is a State Matter. In Malaya, Land comes under the National Land Code therefore Federal Government have no problem. 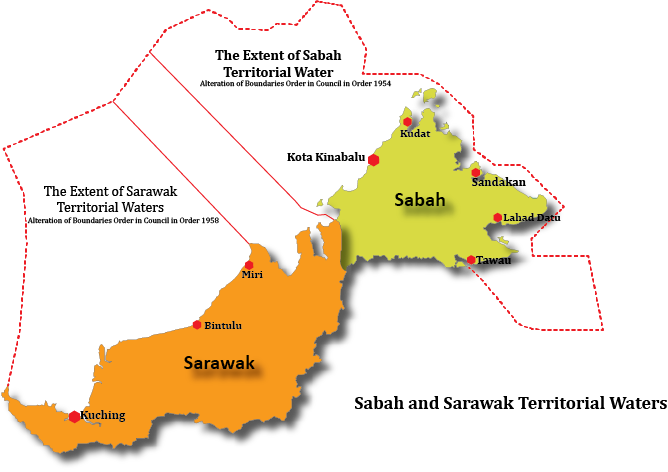 Sabah and Sarawak is protected by the Constitution, the Malaysia Agreement 1963, the Inter-Governmental Committee Report (IGC), the Sabah and Sarawak Land Ordinance and the North Borneo (Alteration of Boundaries) Order in Council 1954 & 1958. Act 750 therefore cannot be enforceable in Sabah and Sarawak and the Federal Government cannot simply take over the Ownership of the Sabah and Sarawak Territorial Waters. Fulfilling UNCLOS is for Malaysia International maritime boundary. This has nothing to do with taking over the Ownership of the Land within the boundary. We all must be vigilant, assertive and vocal so that our RIGHTs and the Control over our Territorial Waters are not taken away from us. We owe this to every Malaysian in Sabah who had made your honorable members of this august house. We Malaysians in Sabah need to know, what is the next step that the Sabah State Government will take? Time is wasting and millions of ringgit is lost while we stand idle indecisive.